Alan let loose and ordered a lot of beer from Epic Brewing, but no one is going to complain about this list when we tap it on Friday, July 13. Andy from Epic will be out talking about the brewery over beers, so swing by and say hi. Few things go as well together as pizza and beer. Even better? 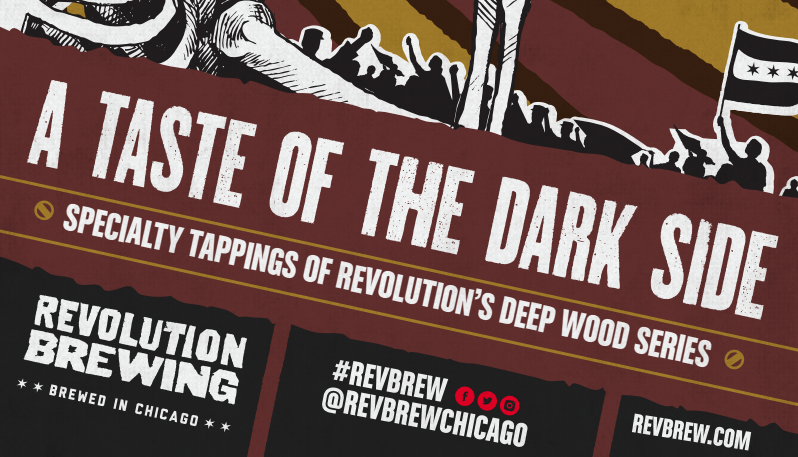 Chicago's own brewery, Revolution Brewing, and Elburn's own amazing pizza-maker, Chuck's Wood-Fired Pizza. Join us at our Elgin area taproom for an evening of great food, beer, and friends as we party down for National Pizza Party Day. Beer list and other event details TBD. On Saturday, May 5th we'll be tapping a keg of Founders Brewing Co. KBS (Kentucky Breakfast Stout). Why? Because we have it and we want to celebrate Cinco de Mayo with great beer...as one should. On deck for food is the always-tasty, ever-reliable Mario's Cart. They'll be serving up tacos, tortas, and more around dinner time (5pm to whenever), so come hungry (and thirsty). NOTE: We’re a 21-and-over venue, so you’ll need to leave the kiddos behind. No outside beverages allowed. Parking may be limited and is for tap room guests only. Our reputation as rebels may proceed us, but we know how to make new friends when we run into people we like. Enter 350 Brewing Company! To celebrate the nerdiest of holidays, we're throwing down with our new allies and tapping their Rebel Scum NE IPA. In addition, we'll have their strawberry lemon kolsch, Howdy Neighbor, on tap for anyone looking for a nice, easy drinking porch beer. If you feel a disturbance in the Force, it's probably the fact that Bop Bar food truck will be out slinging their amazing Korean BBQ dishes all evening, too. This has all the makings of a killer Friday night party. - Chuck’s Wood-Fired Pizza will be serving your munchy needs. Spring keeps trying to sprung, and keeps failing. But our minds are on warmer weather and good times. Our friends at Ballast Point agree, and sent us a keg of their new Aloha Sculpin hazy IPA. We'll have Doctor Dogs out here serving up some special Hawaiian themed entrees, including a Hawaiian Chicken Wrap, Pulled Pork Sandwichs, and more. Bonus: wear your favorite Hawaiian shirt for a chance to get some sweet swag. Note: We're a 21-and-over venue, so you'll need to leave the kiddos behind. Parking is for tap room customers only, so come inside for a beer. Hey, man....you ever had Lagunitas Coffee Stout? You ever had Coffee Stout....on WILLETT barrels? On Saturday, January 27, we'll be hanging with our friends from Lagunitas to celebrate the release of their brand new-ish cans, Sumpin Easy! If you were here when we welcomed in a little beer known as 12th of Never, you know we like to get down for a can party. This date will be know different. In addition to welcoming this new can to the cooler, we'll be tapping a little sumpin called Willettized Coffee Stout. Take Lagunitas' already excellent imperial coffee stout, age it in Willett Rye Oak barrels for a bit, and prepare yourself for a keg of awesome. Doors open to the public at 1pm and we'll get down while the gettins' good. NOTE: We're a 21-and-over venue. You'll need to find someone to watch the kiddos while you're here. All the patrons were stirring, and Alan was stewin'. So they came to Plank Road to indulge in high gravities. From Crystal Lake Brewing did such a beer come. Boathouse Reserve, aged in barrels of bourbon. But deep, dark and rich, and hits like a mallet. and send every guest off with an upside down frown. our friends from up north who make wonderful beer. NOTE: We are a 21-and-over venue. Call a sitter and grab an Uber!